Gluten-Free Cut Out Sugar Cookies. Buttery, fluffy and lightly sweet. Perfect for Christmas cookies and other holiday shapes. The recipe also has a dairy-free option. I love making Christmas cookies with my kids! Every year we try a new cookie that will be fun for them to decorate. We have a Christmas cookie decorating party every year. My kids love to decorate Christmas cookies! This year I decided I would try to make gluten-free cut-out sugar cookies. They are nice and fluffy but firm enough to firm so you can decorate them with icing without them falling apart on you. They are very much like the pre-made, refrigerated Pillsbury sugar cookie shapes you see in the grocery stores. They are buttery, fluffy and lightly sweet. This gluten-free cookie dough holds its shape and does not spread out when you bake it. It’s perfect for Christmas cookies and other holiday shapes. In a medium bowl, add the gluten-free flour, xanthan gum (leave out if your flour already has it), baking powder and stir to blend ingredients. Allow the cookies fully cool before icing them. If you just want to use sprinkles and not frost the cookies, add the sprinkles to the cookies before you bake them. Store in an air-tight container. Enjoy! Make sure the butter is softened and mix the dough really well. Butter must be softened, but not melty. If there are pockets of butter, you’ll find them to melt during baking and cause the cookies to spread. Do not skip the step of refrigerating the dough, waiting for the dough to chill helps the sugar cookies keep their shape. I have also included a dairy-free option to the gluten-free sugar cookies. My husband, myself and youngest son are all dairy-free as well. I used Smart Balance butter for the dairy-free option. So, now you too can enjoy a gluten-free and dairy-free sugar cookie. I promise that it is just as delicious dairy-free butter. 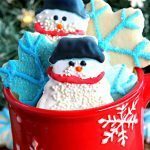 This sugar cookie recipe would work well with several types of frostings. You can decorate them with buttercream, royal icing, or even pre-made cookie icing (like me)! Just make sure your cookies are completely cooled before icing them. I used the pre-made Wilton’s cookie icing that I bought at Walmart. It was super easy to use, and I just added food coloring to it. If you wanted to just use sprinkles to decorate the cookies, just make sure you add the sprinkles before you bake them. These gluten-free cut-out sugar cookies are a fun gluten-free Christmas recipe. 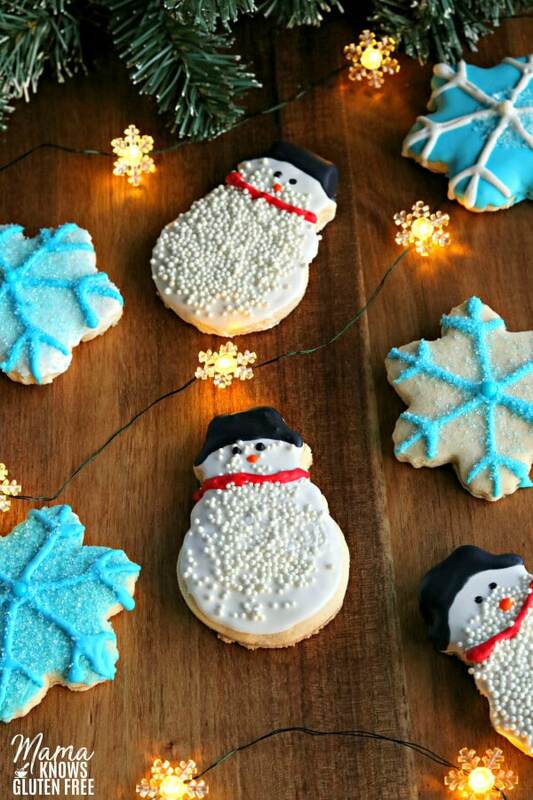 It’s a classic cookie that everyone loves to decorate and eat! More Gluten-Free Christmas Cookies For You To Try! Gluten-Free Cut Out Sugar Cookies. Buttery, a fluffy and lightly sweet. Perfect for Christmas cookies and other holiday shapes. The recipe also has a dairy-free option. 2 1/2 cups gluten-free all-purpose flour I like Pillsbury gluten-free flour. Not all gluten-free flours are created equal. You may experience different baking results depending on the gluten-free flour blend you choose. gluten-free cookie icing I used Wilton's cookie icing. In a large bowl cream the butter, brown sugar and sugar together with a mixer. In a medium bowl add the gluten-free flour, xanthan gum (leave out if your flour already has it) baking powder and stir to blend ingredients. Divide the dough into 2 equal parts. Sprinkle a tablespoon of gluten-free flour on top of parchment paper. Roll one of the dough balls onto to about 1/4″ thickness. While you are cutting out the first set of sugar cookies place the second dough ball in the refrigerator. 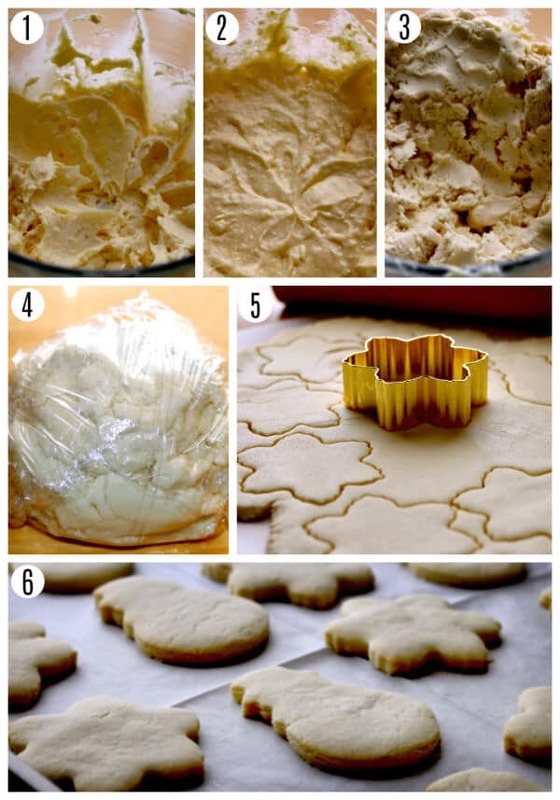 Cut the cookies out using a cookie cutter and place the shapes carefully on a parchment lined cookie sheet. Roll out the second dough ball and repeat the steps from above so you will have two cookie sheets of cutouts. Bake for 10-12 minutes or until the edges are very lightly browned. If you like your cookies a little crispy bake for the full 12 minutes. Please watch your cookies because all ovens are different. Allow cookies to completely cool before icing. Enjoy! I used Smart Balance butter for the dairy-free option. Make sure your cookies are completely cooled before icing them. I used Wilton's Cookie Icing. 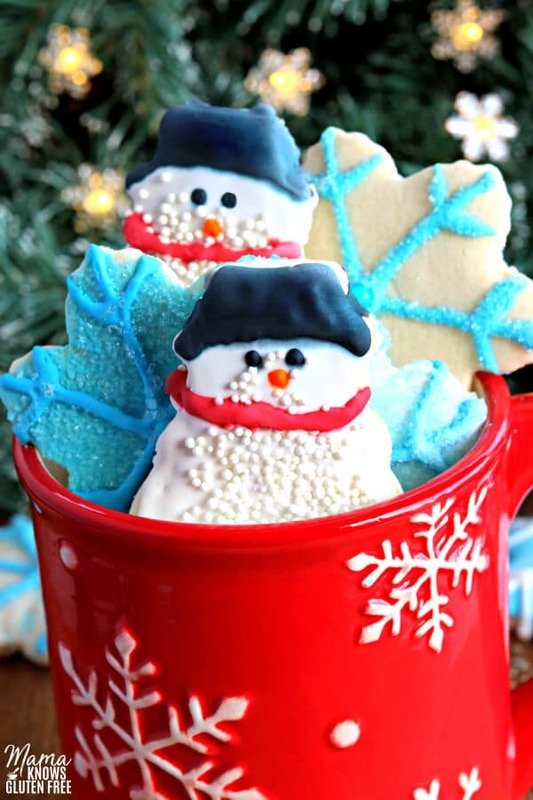 Sugar cookies are a “must make” over Christmas and yours are just too cute! Thank you so much, Nicole! My kids had a lot of fun decorating and eating them. Thank you for this great recipe. I am not a baker, so was hesitant to make these with my daughter, but I thought I would give it a whirl and hope for the best. The last sugar cookie’s I made just ran all over the cooking sheet and looked wretched, so I wasn’t really looking forward to the process. However, I was very pleasantly surprised and have bookmarked this recipe for future cookie making! The dough held together well. I used Namaste Organic Perfect Flour Blend as that’s what I had in the cupboard. It rolled well and held together well. Thank you so much for these great cookies and Merry Christmas! 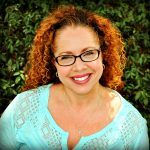 Hi Tracy thank you so much for the wonderful 5-star recipe review! It makes my heart so happy to hear that you and your daughter enjoyed the sugar cookies. I have never tired Namaste Organic Perfect Flour Blend, but I will have to look for it. You are so welcome, I love sharing what I make for my family. Wishing you a blessed Christmas. Thanks again! These were delicious! We have a dairy allergy and nut allergy (we left out the almond extract) in our family, and we also do gluten free! This was a safe cookie for all of us to eat and it tastes just like the sugar cookies we made when I was growing up! Thank you so much Lisa for the wonderful 5-star recipe review! This makes my heart so happy to hear! It means so much to me that your family enjoyed the cookies and could enjoy a safe cookie. This really made my day! Thank you again for sharing this with me. Hands down…best sugar cookie recipe I’ve ever made. Not just gf either, best ever! They were for my daughter’s class. She is gf so I try to be the one to bring the treat because then she can eat like everyone else. The Betty Crocker boded sugar cookies are good, but frail. These were perfect, delicious and held their share like none other! A class of first graders decorated them and they held up! You can’t ask for more than that. I printed this to make sure I can make them every year!!! Thank you so much Kelly for the amazing recipe review! I can’t tell you how happy this makes my heart! I know how important it is to have your kids feel included, as I am also always having to bring the treats, not just for myself, but for little boys too. I am so happy to hear that everyone had fun decorating the cookie and enjoyed them. This really blessed me and made my night! Thank you again for kind words and encouragement.